The quilt I've been working on this week has 9 fence posts in the design. I've done wood grain before with a round knot. But I saw a different intrepretation of wood grain in a quilting design in the book, Free-Motion Quilting for Beginners, and those who think they can't, by Molly Hanson. So I decided to try her more oblong and pointy type of design. I used the walking foot to quilt the first fence post of the day. I figured that would work well with the long, slightly wavy lines of the wood grain. With knot is so linear and pointed that looked feasible too. It did work, but I had to stop and rotate the quilt around a number of times to create the knot effect. I realized that if I switched over to free-motion quilting, I could change the direction of my stitching, rather than rotating the whole quilt when I needed to fill in a tight space. This a fence post quilted with free-motion quilting. It was a lot easier to create the knots in the wood using free-motion quilting. The free-motion knots are less pointy, a product of my brain and gross motor muscle memory, but I think I like them more. 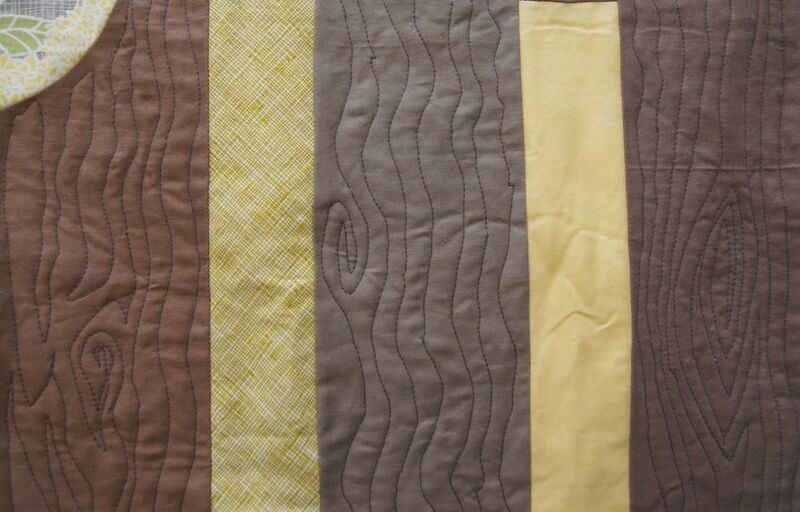 I did rotate the quilt at either end of the fence posts when I was stitching the long wavy lines of wood grain. Both methods definitely work. The the free-motion design which I stitched more spontanoesly was much easier and more fun to do. The bottom line: use the technique that works best for you and your skill level and that's the most fun!